A few months ago, I mentioned a technique that we use to clean milkweed seeds after harvest. We spread the fluffy seeds out on a concrete floor and light the thin pile on fire, burning the fluff off the seeds. It’s quick, easy, and fun. I learned of the technique from a fellow prairie restoration ecologist many years ago, and we’ve been using it ever since. I’ve also shared the idea with quite a few others. Burning the fluff off of milkweed seeds. Don't try this at home. …Funny story. Over the years, a few people have asked whether or not the heat from the fire might damage the seeds, ruining the germination rate. I’ve always had a standard answer. First the idea came from others, who had been using it for a while. In addition, the fire moves so quickly and our piles are so thin, the heat is almost surely be insignificant. Plus, these are prairie seeds, and are thus adapted to fires. Right? When I mentioned the fluff burning technique on this blog, my friend James responded that he had actually tested the germination results after doing something similar and that the results from the burned seeds had been really bad. Surely, I thought, he must be doing it differently than I am. Probably his seed pile is too thick, making the heat intense enough to kill the seeds. Plus he tested it on a different milkweed species than I had. But, I figured it’d be fun to run a test anyway, so I asked Mardell, who is in charge of our small greenhouse, to try it out. She planted a batch of seeds that we’d burned and a batch that we hadn’t. You can see the results in the photo below. Pretty clear results, aren't they? This entry was posted in General, Prairie Restoration/Reconstruction and tagged burning, fire, fluff, milkweed seeds, prairie restoration, seed cleaning, seed processing, silk by Chris Helzer. Bookmark the permalink. Thanks for showing the results of your test, Chris! I’ve always wondered about this. I used the burn off technique a few times, and saw how damaged the seeds looked, so I stopped doing it. But I never actually tried to grow the seeds. Nice to know that my instinct was right. It’s a much slower technique, but I open the pods after the seeds are brown, but before the pods dry out completely, and “twist” the seeds off the slightly damp silk. It seems to work fine, although I haven’t actually tried growing the seeds to be sure. Marcie – that’s our favored technique at the moment too. As you say, a little slower, but really not too bad. Can we try that at home? That would be fun! Which species of milkweed did you test? I don’t doubt your results, but I burned the fluff from Ascelpias sullivanti and A. tuberosa this past winter, and I have had great germination (i.e. lots of seedlings) of both species in the greenhouse. James. Really interesting. I was testing A. syriaca and speciosa. I’ve now heard from several others by email and otherwise that have also tested burned seeds and had almost no germination. Maybe you need to teach us how you’re doing it! Can you give us a quick description of your method? Sorry for the very slow reply–I don’t collect much seed, so I burn the fluff off in small batches. I lightly cover a cookie sheet with the seeds and attached fluff. I’m guessing that there’s not as much heat build up compared the inferno in the picture above. So, Chris: Have you run careful tests to see how long it takes to reduce listeners to the blank stare when you blather on? (joke, as I don’t believe that you ever “blather”). 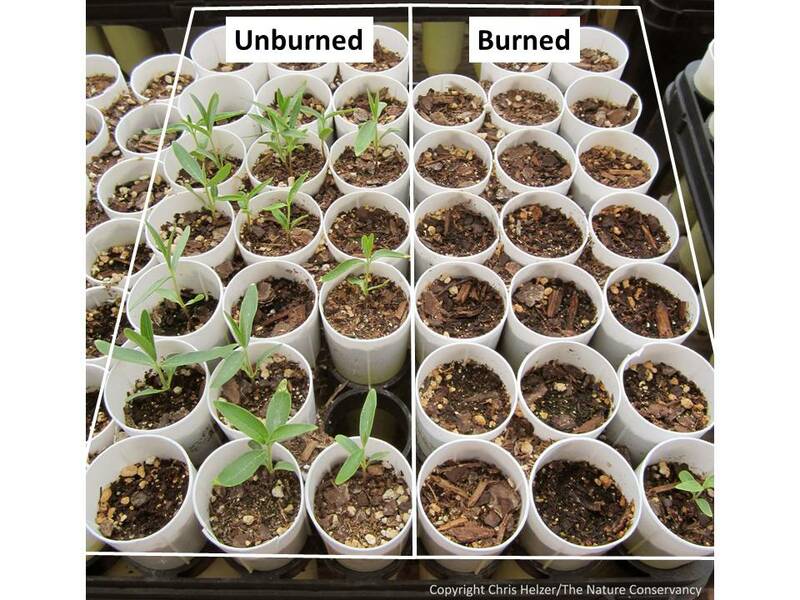 Neat post, including photo of different results of unburned vs burned. How would putting the seeds in a lapidary tumbler, along with some rocks or coins. To knock the fluff away from the seeds? If you have a lot of seeds this would need to be done in batches, At least there wouldn’t be heat to endanger the seeds. Dan – There are some nice techniques out there for removing fluff – many of them designed, or at least made available, because of the increased interest in milkweeds for commercial uses and for monarch butterfly conservation. They involve something similar to what you’re talking about, but a little more sophisticated. I think your technique would likely work. Stephanie’s comment above is also a good technique – as is Marcie’s. A brown paper bag always worked for me. Gather the seeds into the bag and shake vigorously. Cut a small hole in the bottom corner to remove the separated seeds……….. Simple but effective – I like it. Your original post about innovations in prairie restoration techniques has an excellent photo of burning milkweed seeds and mentions you learned that from Indiana. Maybe that was us at Kankakee Sands? We used to do that, but now we don’t anymore. The down sides of it was that it still took a lot of labor to open each fruit by hand, it was very smoky, the seeds still weren’t totally ready for the planter and most importantly, Kelly Schultz of Lake Co FPD (IL) shared with us a study she did showing that germination of “burned” seeds was terrible compared to that of unburned seeds in the greenhouse. If you’re not having problems with milkweed establishment from seed while burning the seed, then keep doing it. We’ve opted to play it safe. Randy Arndt shared with me that they put their fruits into the hammer mill fresh and moist. The seeds break free and the comas and fruit pieces clump together since they are not dry (less fluffy mess). That mass is what we dry, adding to it as we harvest. Once all is harvested, milled and dried, we use the fanning mill to separate. We should do a comparison ourselves though of the seed processed this wet way in the hammermill and see how well it germinates compared to seed that is all done by hand with no fire. Hard to argue with you on that, Victoria. Especially if it turns out that it’s really deadly to the seeds, of course… I’d love to have a milkweed pillow myself. I have been thinking about the burn method since your first post. While I have not tried this yet. Rather than burning on a concrete floor. Try burning on hail screen allowing the air flow to carry the heat away from the seed. Also different sizes of hail screen with a thin layer of seed and a shacking might put the seed bellow the screen. Once the fluff is fired fired the seed should drop away from the heat. Just a thought. Tim- I’ve thought about some similar ideas, and think they’re worth trying. On the other hand, I think Stephanie, Marcie, and others commenting here have excellent examples of other ways to clean the seed. I guess I need to decide how much I care about the fire portion of the process… It might make a lot more sense to just remove the seeds without involving pyrotechnics! Thanks for the great ideas. I like the guy that is about to climb the shelves in the back round. At this weekend’s annual membership meeting of Wild Ones natural landscapers, we agreed on a partnership with Monarch Joint Venture Program and a talked a lot about cleaning Milkweed seeds. 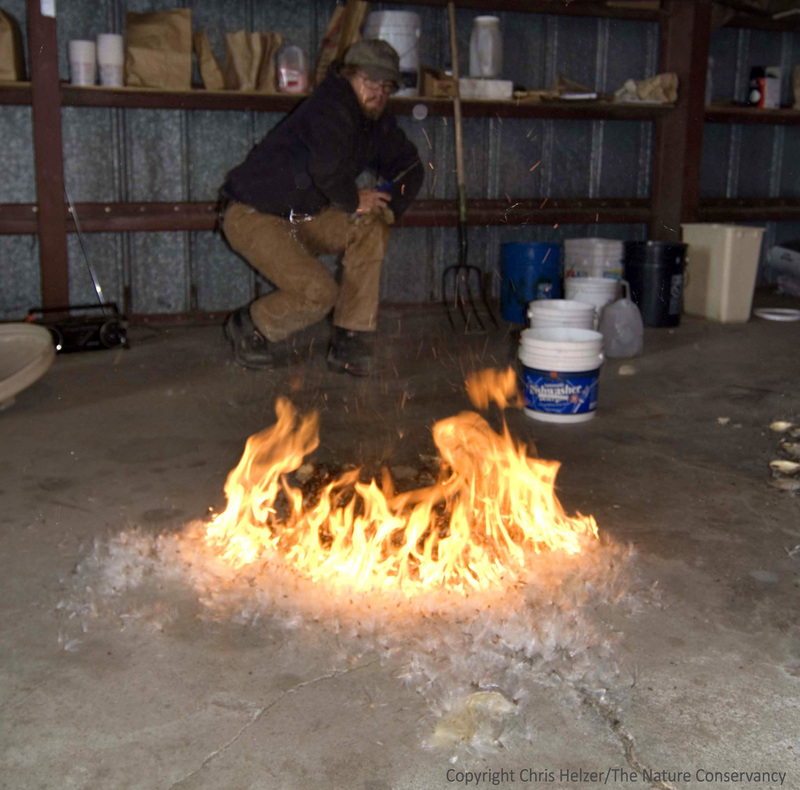 After one attendee recommended burning the fluff off, I mentioned this blog post. Some respnded that they burn small quantities successfully. However, that led someone to give me this U tube video of a milkweed fluff separator. http://monarchwatch.org/bring-back-the-monarchs/milkweed/seed-separator. Maybe it would work with the larger quantities you’re working with. Thanks Hal – I’ll check it out!